Look who I picked up at rehab this afternoon? Of course she got out just in time to head off to Amsterdam so she can start the whole process all over again. If it's one thing that Flo Mingo really enjoys - it's rehab! Flo has got a jammed pack schedule in Amsterdam. She's going to be meeting up with a whole bunch of bloggers from Switzerland and France - she is so excited she could just pee. She's also planning on meeting up with some fans of the Feast of Fun (formerly Feast of Fools) and give out some surprises that Marc & Fausto gave her. But most of all she is looking forward to spending a fabulous time in Amsterdam with her closest and dearest friends, smoking, joking and causing general havoc all while trying to evade Interpol. Wish her luck, cuz she's gonna need it! 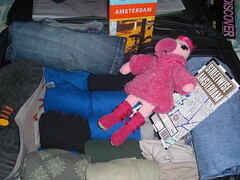 Totally jealous that you and Flo are going to Amsterdam! Hope you have a great time - happy 40th! I really enjoy your blog. @Van Goat - Thanks so much for stopping by. Keep following I'm going to try and post a lot of pictures. @CS - I am SO EXCITED to be meeting you in person - FINALLY!!!! !